The AALL/LexisNexis Call for Papers Committee promotes the scholarship of AALL members and of students through its annual “Call for Papers” competition. Papers, which may be submitted by active or retired AALL members, or by students in library, information management or law school, may address any subject relevant to law librarianship. Through the competition, the Committee seeks (1) to promote scholarship of interest to the profession of law librarianship; (2) to provide a creative outlet for law librarians and a forum for their scholarly activities; and (3) to recognize the scholarly efforts of established members, of new members, and of students who are considering a career as law librarians. New Member Division: for recent graduates and AALL members who have been in the profession for fewer than five years. Student Division: Those enrolled in library school, information management school or the equivalent, or in law school, during the Fall 2018 or Spring 2019 semester. Entrants in the Student Division need not be members of AALL. If the Committee believes that a paper is more appropriately placed in a division other than the one originally selected by the entrant, it reserves the right, with the entrant’s permission, to place it in a different category. No paper or portion of a paper that has been published or accepted for publication before March 1, 2019, will be eligible for consideration. Before submitting a paper, all authors are responsible for verifying that a substantially similar paper has not been published elsewhere. Papers submitted for courses are acceptable if they otherwise comply with the requirements of this contest. A paper may address any subject relevant to law librarianship. It may be scholarly or practical in substance and tone, but the subject should be explored in depth with appropriate reference to sources and documentation of assertions. Co-authored papers are acceptable, but each author who submits a co-authored entry for the Student Division must meet the student eligibility requirements of this category. 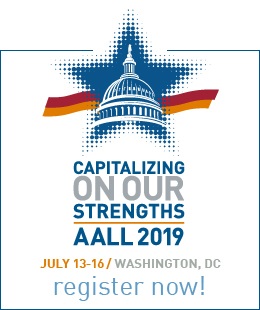 Papers in the Open and New Members divisions may be co-authored with non-AALL members so long as the AALL member is the primary author of the submitted piece; in this case the prize will be awarded to the AALL member only. When all co-authors are AALL members, the winners will share the $650 award and the Short Form Division winner will receive $300. Entrants may submit more than one paper, but, may win only one prize per year. To encourage as wide participation in the competition as possible, authors may win a prize only twice in the same division. Papers must be numbered and double-spaced with 1 1/2 inch margins. Past winners in the Open, New Member, and Student Division have typically run between 30-40 pages. Citation and style must conform to the requirements outlined in the Law Library Journal Editorial Policy. Each submission must be accompanied by a short abstract and a completed Application Form. Submissions for the Student Division must include a supporting letter from an instructor at the institution where the student is enrolled (preferably the supervising faculty member of the paper). 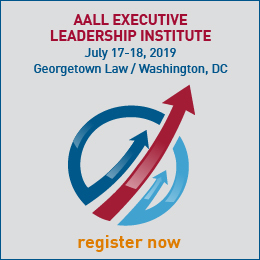 All submissions must be Microsoft Word or Adobe PDF files and emailed as attachments to the AALL membership services manager. For Student Division submissions only: an instructor’s letter. To be eligible for an award in the Open, New Member, or Short Division, papers and all required supporting documents must be received by March 1, 2019. To be eligible for an award in the Student Division, papers and all required supporting documents must be received by May 16, 2019. Questions? Please contact Kylie Weller Laga via email or at 312.205.8022. Questions? Please contact a member of the AALL/LexisNexis Call for Papers Committee. Critical Legal Research: Who Needs It? Diversity: So How is AALL Doing? Are You a Member of the Law School Community? : Access Policies at Academic Law Libraries and Access to Justice. Should Academic Law Libraries Continue to participate in the Federal Depository Library Program? Paper vs. Electronic Sources for Law Review Cite-Checking: Should Paper be the Gold Standard? The Database and the Fields of Law: Are There New Divisions of Labor? Chicken Little at the Reference Desk: Is Reference Liability a Myth? The Law Review Symposium Issue: Community of Meaning or Re-inscription of Hierarchy?